Personally, I disagree with Larry, and I think that the focus should be on the customer winning. Hopefully that’s often through your product or service offering, but sometimes your competitors can serve customers looking for a solution better than you can. In those cases, I think all parties (your company, your competitor and your customer) are better served by acknowledging that. In fairness, Larry Ellison is the fifth richest man in the world, so if that’s how you keep score, he has much more credibility than I. On the other hand, he was paraphrasing Genghis Khan with his quote, so I guess it all depends whom you want to emulate with your marketing. But, whether you agree with Larry or me (or even Genghis), I’m sure that we can all see the value in better understanding what competitors are doing. 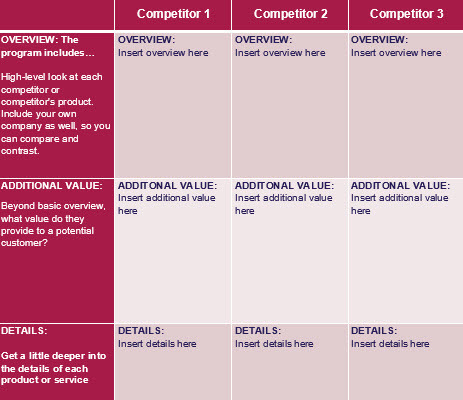 Moreover, a competitive analysis is an especially helpful tool to help you craft your value proposition. To help you conduct a competitive analysis, we’ve created a few free templates loosely based on the Summary Competitive Analyses we conduct for our own Research Partners here at MECLABS. 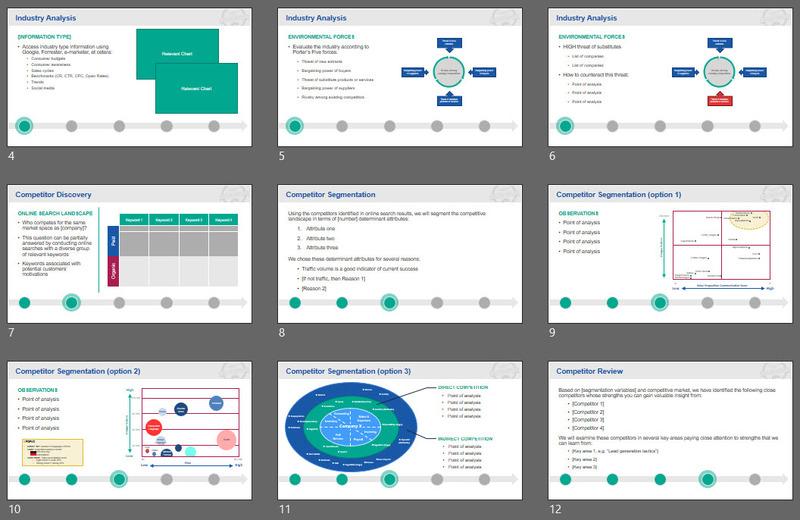 For a slight deeper dive, you can use this PowerPoint template. For a more in-depth look at your competitive landscape, this competitive analysis Excel template might be helpful to you. If you’re only looking to get a very simple breakdown about your competitive landscape, you can use this simple Word document. Even better, you can use these documents to communicate at three levels. While the fields aren’t the same in all of them, the PowerPoint and Word templates are meant to be a summary of the Excel template. 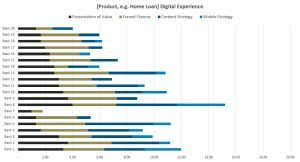 So, you can use the Excel template to guide your own competitive analysis, the PowerPoint template to present this analysis to key marketing leaders, and the Word document as a memo to senior business leaders who would be less interested in all of the details. 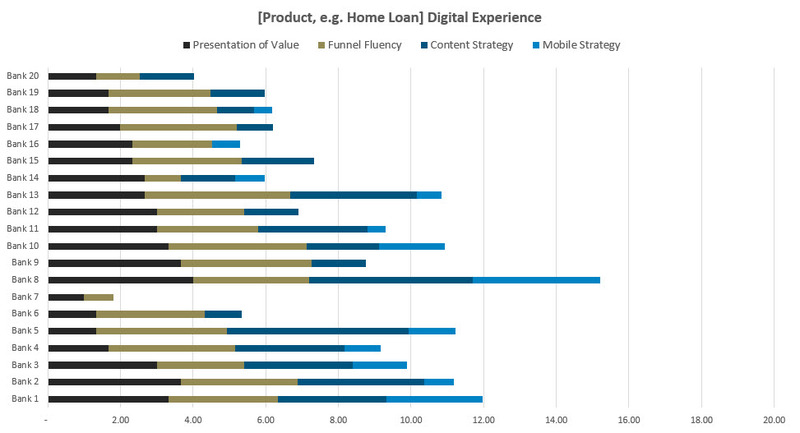 Digital marketing makes conducting a competitive analysis easier than it has ever been. While in the past, your best opportunity might have been to dive into the SEC filings of a public company, and perhaps sign up for their mailing list and buy some data from a business information vendor, now much of the information you need to know is publicly available … even metrics. You can use social media and product review sites to see what customers think of your competitors, as well as obtain some real metrics on how many followers they have. You can also use sites like SimilarWeb and Alexa to get a very rough (and let me emphasize, very rough) look at the traffic numbers and patterns for your competitors’ sites. “Start the competitive analysis as if you were a potential customer and a run couple of searches with your popular keywords or using keywords that search engines recommend,” said Ana Gabriela Paez, Associate Director of Research, MECLABS. That last point Gaby makes is crucial. After all, your competitors aren’t who you think they are, your competitors are who your customers think they are. So, if your goal is to make the best horse-drawn carriage and that is your only focus, you’ll never see that automobile coming. And, perhaps most importantly, don’t overlook your own efforts. A competitive analysis is of little practical use if you don’t look at your own products and marketing materials with the same inquisitive eye, and then place your findings side by side with your competitors, stand shoulder to shoulder and see how you match up. And, while you’re standing next to them, if you follow the teachings of Larry Ellison and Genghis Khan, give them a good, hard kick in the shin. Excel template is composed of xml files and there is no xls document in it. We uploaded the original file, which was created as a .xlsx. If you have an older version of Excel, then you might would have some issues. We have now added the template in a .xls file as well, but there may be some functionality lost with the version differences. I hope this helps. Let me know if there’s something I else I can do to help. Ellison once told his sales force that Oracle’s competitive objective was to “cut off their oxygen,” but the quote you attribute to him was stolen from Gore Vidal (“It is not enough to succeed. Others must fail.”) who said it in the late 1970s. I have learn several excellent stuff here. Certainly value bookmarking for revisiting. I wonder how so much effort you place to make such a magnificent informative web site. Any suggestions for technical evaluations of industrial software products? And specially B2B products? I like these templates very interesting. Please update me with the current ones. The templates are a fantastic help! Any suggestions or participants occupying the Mobile and or Application Development space? Thanks for these – very helpful. Do you have any thoughts on the usefulness of a visual competitive mapping vs a more linear competitive analysis? When do you think you should use each one? I think those templates are really good to get a start. But I think competitive intelligence in year 2015 includes a new strong component of monitoring marketing. This necessity comes along with the explosion f marketing channels in the digital world. Its really crucial to keep track of successful campaigns of the competition and to understand what is working within the target audience. Thanks for reading and commenting Oleksandr. I agree, a competitive analysis isn’t a one-and-done activity. The marketplace is always changing. For example, anyone who conducted an analysis of the grocery marketplace a few months ago would probably be well served by understanding how recent developments change their competitive position in the marketplace. I’m a big believer in properly attributing a quote, so thanks for questioning the source. According to the article, the first usage of a pretty similarly phrased idea was in 1959 by Somerset Maugham. Gore Vidal didn’t actually say it (he said the similar “Every time a friend succeeds I die a little.” but in an article by Wilfrid Sheed in The New York Times about Vidal, he uses the similarly phrased idea and credits it to La Rochefoucauld. And then in 1988 Larry Ellison said, “It is not sufficient that I succeed – all others must fail” and crediting his paraphrase of the quote to Genghis Khan. While this seems like it’s an authoritative source, I’m not 100% sure if is exactly accurate. I think the big picture is that, while many have had this idea through history, whether the idea started with Genghis Khan, La Rochefoucauld or Somerset Maugham, this is roughly the way Larry Ellison used to subscribe Oracle’s competitive stance. While I disagree with the extreme nature of this sentiment, I do agree that it is important to keep an eye on your competition. After all, your value proposition is relative to other value propositions in the marketplace and dynamically changes as your competitors’ value propositions change as well.